3DAD: What were the first packages you used to create digital art? How did you get introduced to these and were you pleased with the initial results? PD: I think the first app I used was Aldus Photostyler. This was years and years ago. I think it’s still going. It’s a nice program. The first 3D application was Bryce. Probably Bryce3D. I think it was free on a magazine disk. 3DAD: Much of your work is in the sci-fi genre and I notice from your bio you’ve worked at Half Price books – is it sci-fi book cover art that has inspired you the most with your creations, or does this inspiration come from another quarter? PD: Probably. I’ve always read Sci-fi and break the golden rule and judge a book by it’s cover. Which means I’ve read some really bad sci-fi. But the books had cool covers. So, yeah, all the books and movies must influence me a lot. Movies and TV are a pretty obvious influence as well. I’ve also been influenced by things around me. I remember one day seeing a cigarette lighter that just had this really cool shape. I modelled it and turned it into a three wheeled cycle. 3DAD: I’ve noticed you’ve used Bryce in the past, but now you are using Carrara more frequently. What aspects of Carrara make you use this software more? PD: For me, Carrara has a very similar feel to Bryce. Although Bryce has a really groovy UI. The switch to Carrara wasn’t as hard a learning curve as I expected. It’s as complicated as you need. To start with I didn’t use all the features and created images from a Brycer perspective, just a lot quicker. But as I explored the features and read blogs and forums, I learned that it can do a lot of things that the big applications can do. Global Illumination, HDRI and caustics for example. You could fake these in Bryce, but Carrara does it with less effort. The newer versions of Bryce now have some of these features. But the main reason I like Carrara over Bryce is the speed. In Bryce once you click the render button you have to wait for some time before seeing if you like the result. With Carrara being so quick it’s not an issue to render and within seconds see what you’re going to get. 3DAD: If you could bolt on something extra for Carrara, to boost it’s functionality – what would you add? PD: I often think of something that would be a cool feature only to find out that Carrara can already do it. It seems that Carrara is in good hands with DAZ. It does everything I need it to do. For now…. 3DAD: You also use Wings 3D – which I believe is open source modelling software – but beyond this I’ve never used or experienced it. Tell me about Wings 3D – what are it’s strengths and is there a growing community of modellers that use it? PD: Wings3D is wonderful. Not least because it’s free. It might not have some of the features of other (more expensive) applications. But for me it can do pretty much everything I ask. Probably because most of my models are of a technical nature. I’ve not really explored organics with it. It’s very simple once you get to grips with the interface and is pretty quick. It also autosaves, which has saved me numerous times. I’m not really part of the Wings community. It’s a tool to create things I can render in Carrara. Carrara does have a modeller built in, but I’ve never used it. I also got Hex when I got Carrara, but not really got to grips with that either. 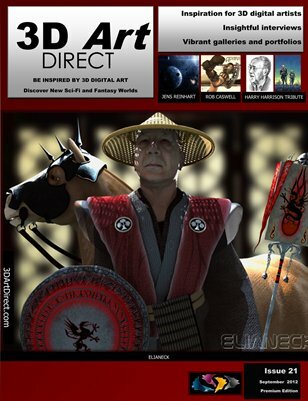 3DAD: You have a nice collection of models that you trade at DAZ3D. What do you enjoy most – is it modelling or creating the art with the models? 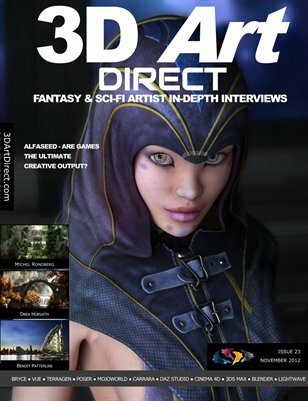 PD: DAZ3D seems to be an ideal place to sell models. 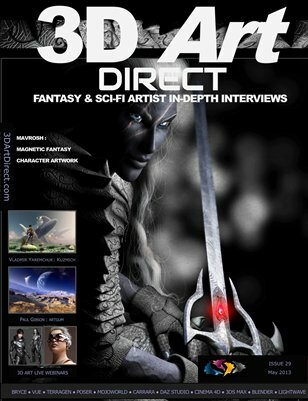 Their staff are very helpful and they are very generous to their published artists. Modeling is fun. But it’s not the aspect that drives me. I like to create the art with my models more. A model can look really good in Wings, but it’s not until you put it into a scene and throw some lights at it that you can really see what you’ve created. 3DAD: From the set of models you’ve created, what is your favourite so far and what were some of challenges in constructing it? PD: Wow, how do you pick your favourite child? Okay, the “Steampunk Sub”. (That was easy). It’s not a complex model but I do render with it a lot. “The Bug” is also a favourite. It was even supplied with a version of Bryce for a while, so I often see it popping up in peoples renders. The sub didn’t have any real challenges with the modeling. I wanted a quirky fun model that still looked like it would work. That was harder than the creating. I don’t plan anything out. I based it on the ship “The Cavorate Sphere” from the movie “First men in the moon” which was steampunk before there was steampunk! I just started with an octotad and then extracted, inserted, pushed and pulled until I got the basic shape. “The Bug” was harder and was totally different to what I started to model. I set out to model a truck! The suspension of the truck turned into the landing gear. Since I hadn’t started out to model a ship, getting a cockpit on it was a bit of a challenge. Maybe I should start to plan these things. 3DAD: When you first stated out with digital art, which artists have stimulated you the most and why? I notice you’ve mentioned Stephan Martiniere. 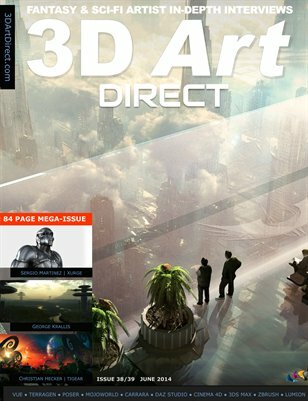 PD: Stephan Martiniere is my current favourite. But there are a ton of artists which I admire and not just digital artists. Michael Wheelan was an early inspiration. Even before I got into digital art I was copying his work. Once again he’s a book illustrator. He did wonderful covers for some of Asimov’s most known books. I also like Chris Foss and John Harris for their more “arty” sci-fi. But yeah, right now Stephan Martiniere is awesome. He has a great way of giving a sense of scale. With a large ship on a black space background it’s very hard to get an idea of scale. Even putting a planet in the background can’t really express the scale. Martiniere gets around this by putting planets in the foreground! If you can see a planet in front of a ship, then it’s a big ship. I also love the fact that his “space” pictures have very little space in them. 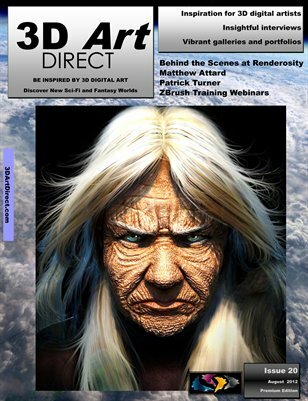 This was the main driving force behind my pictures shown in 3D World Magazine. Renderosity was the first place I started to seriously post my pictures and I got inspiration from the artists there. There are a LOT of really good artists. The Bryce forum at Renderosity has a lot of really talented and helpful people. They were my inspiration, my muse and my shoulder to cry on when Bryce crashed. The hardest part of moving to Carrara from Bryce is that I don’t contribute to the Bryce forum as much now. 3DAD: You’ve made up a few example book covers in your Rendo gallery (eg Revelation Space)– is this a direction you’d like to explore more? For any budding freelance illustrators, I would recommend using the on-line service of 99 Designs. It’s main strength is that it allows you to be on an even playing field with large graphic design houses when selling your artwork. PD: Because my inspiration comes from book illustration it stands to reason that I create with that in mind. Although I generally forget that publishers like space for words. I would love to see my art on a book.But I’m not sure that I could handle deadlines and publisher constraints. Maybe that would remove some of the fun for me. That said, if a publisher wants to use a picture, then hey, give me a call. I would love to have the time (and skill) to write a sci-fi novel. But I think my ideas are not matched by my writing ability. 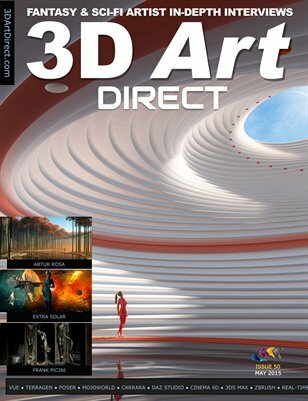 3DAD: You’ve had the privilege of having “Asteroids” and “Approach” being published in 3D World magazine, using your own models. What features of these images are you most proud of? PD: Getting the email was a shock. 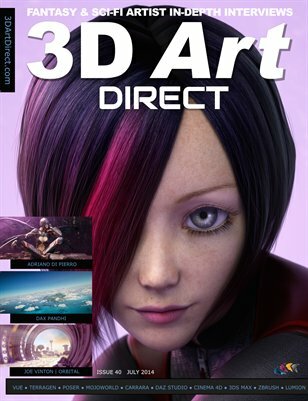 3D World Mag saw the images on CG Society, which has a LOT of professional artists posting. I certainly didn’t expect my two little images to catch anyone’s eyes. I had to double check the email to make sure they hadn’t made a mistake and replied thinking it was a joke. 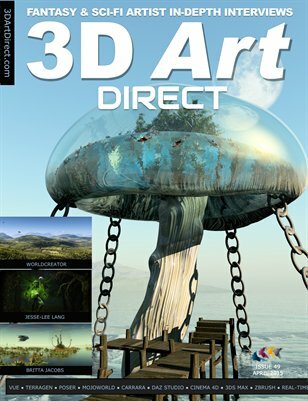 I mean, this is 3D World Magazine! I am really happy with the “Approach”. Martiniere’s inspiration is evident I think. It includes a very colourful background and no real empty “Space”. I think I managed to get a good sense of scale on that too. I like to play with the scale. The small ship is pretty large on it’s own, but then to have it in the shadow of the hulk in the background really puts the scale on a different level. I also really like the harsh lighting on the top of the big ship. Lighting can make or break an image and I hope it made this one. 3DAD: I really like your Steampunk submarine and the set of underwater images you’ve created with this model. Are you a big fan of Steampunk? PD: Steampunk is cool. It’s quite a wide genre, clothes, vehicles, machines big and small. Pretty much anything we have today can be converted to Steampunk. It’s been around for a while but I still think it’s a genre that’s going to keep getting bigger. It’s certainly something I intend to explore more in future works. 3DAD: You have some really nice renders on Steam Engines – are these quite complicated models to construct? Are you looking for authenticity with how everything fits together with these? What are some of the trickier aspects of these models? PD: The recent steam engine is an on-going project. I want to create a Steampunk house but working with what DAZ would be able to sell and what I want to create has been a challenge. It’s difficult to create something real, or based on something real, since there will always be people who nit-pik. I set out to create something that people know is a steam engine, even if it wouldn’t actually work or that no sane person would ever build. I mean who would use long drive belts when it would be easier to drive the wheel directly. If you look closely you will work out that the piston would get stuck as it rotates. Thinking out things like that are a greater challenge than the modelling. The components of the model itself are pretty straight forward. The number of pieces lead to it looking more complex than it really is. This model is currently on the drawing board and may stay there for a while. 3DAD: “Huey02” comes from the classic sci-fi movie of “Silent Running”. It’s a cute robot design which is often overlooked. Any notions of modelling the main Silent Running ship at all? PD: What a great movie. The robots were wonderful creations. They had such emotions for essentially a small box, and this was before Star Wars. I work with a lot of people in their 20’s who have never heard of the movie and they don’t know what they’re missing. The Valley Forge was a great model too. It would probably still stand up to being in a movie today. My very early renders in Renderosity reflect the design. Even the Approach has bio-domes. It’s never far away from my mind. Greater modellers than me have already created great versions of it. So I’m not sure I will even try. 3DAD: You’ve done a number of renders based on Star Trek? Are you a fan of the original series models most? PD: So many people have made Star Trek models and mine are way down the list on quality so I was modelling purely for my benefit. Star Trek is another thing where there are plenty of people to nit-pik. So I didn’t set out to create the Enterprise. I set out to make a model in the style of Star Trek. One thing that bugs me about Star Trek and most images based on it is how brightly lit everything is. It just doesn’t seem real to me. I wanted to render the ships in a more natural setting. Just lit from the stars and the lights on the ships themselves. As for the original vs the newer ones, I really like the Enterprise from the early movies. Later on there are so many different designs of ships that it was starting to lose some of the cohesion (for me at least). 3DAD: “Align” The alignment of planets is quite a powerful image, heralding some rare event – most notably used in 2001 – is the latter what prompted this image? This was my first attempt at using the Lunar Cell plug in. This image is just me showing off. The ship gives a little bit of interest. It does have a very 2001 feel to it, although that’s been copied many times. I don’t recall if that’s intentional or not. 2001 set the way for almost every sci-fi film to come after it. I used to work on support for a software company and would often speak to Stanley Kubrick, who used our software. I had so many questions about 2001, but never managed to build up the courage to ask him. PD: This was my first attempt at using the Lunar Cell plug in. This image is just me showing off. The ship gives a little bit of interest. It does have a very 2001 feel to it, although that’s been copied many times. I don’t recall if that’s intentional or not. 2001 set the way for almost every sci-fi film to come after it. I used to work on support for a software company and would often speak to Stanley Kubrick, who used our software. I had so many questions about 2001, but never managed to build up the courage to ask him. 3DAD: “Eclipse” is a subject that is not often explored in sci-fi art, were you pleased with the resulting eclipse effect you gained? PD: That was more playing with a tutorial I had found on creating the whispy effects. It’s not great, but not terrible either. It’s good to search around for tutorials. If you’re trying to create an effect, chances are that someone has already done it. 3DAD: You’re using Photoshop and you’ve mentioned a plug in called Lunarcell (in “Align”) allowing you to create planets– what can it do? PD: It’s not amazingly hard to create realistic planets in Photoshop. I’ve found a number of really good tutorials. But Lunarcell does it all for you in a few clicks. It has settings for the atmosphere, land, sea, cities and loads of other options to light the planet from multiple sources. It’s really a very good tool and quite good fun to just play around with. 3DAD: You’ve mentioned in a number of your images (eg “Cold Sun”) that you’ve created the background using Photoshop and this is used as the backdrop in Carrara. Does your workflow start with the Photoshop background most of the time? PD: I have a number of “stock” backgrounds that I’ve created. I do render using one of them to get a basic idea of what I want to achieve and then I may go and create a new background. So yeah, most of my images start in Photoshop and end up in Photoshop with Carrara in the middle for the models. I don’t do a lot of postwork since Carrara produces pretty much the result I want. But sometimes it’s handy to sharpen, remove the odd flare, fix the colours and what not. 3DAD: “Bryce Killer”. You mentioned that this image included a volumetrics atmosphere I think and took some time to render. Have you had other comparable renders have almost stretched your processors to the limit? PD: That was one of the Bryce renders that you need to start before you leave on vacation. OK, not quite that long but a while. Bryce, god bless her, does certain things really well, oceans and mountains, and can do other things if you have the time. Refractions, reflections and volumetrics. Even softshadows slow her down. 3DAD: “Hex” did remind me of the ZX81 manual as well. I suddenly want my manual back and an 81 computer, just for nostalgia! PD: John Harris. Even before I knew about digital art he must have had an effect on me. Not sure I want my ZX81 back though. They can’t run Carrara for one thing! Yesterday I was just browsing around looking for a new desktop wallpaper when I came across a dark blue one made up of hexagons. It was really cool, but slightly flat since it was seen from head on. I thought it would be even cooler to render it from an angle, so I created a hexagon grid in wings and rendered it in Carrara for my new wallpaper. This morning I was just staring at my glossy new wallpaper when I was reminded of the monolith from 2001. This looked like a lot of hexagon monoliths. So I fired up carrara again, put in my nato fighter. Then it started to look like something from Tron, so I rendered a few square glass clouds. Now I think it reminds me of the old art work by John Harris for the ZX-81 manual (showing my age a bit now). So, yeah, it’s weird where we get inspiration. This is a cross between 2001, Tron and John Harris. 3DAD: “ISS Mark 2”. The ISS is a lovely great big structure to render for an image and it’s great to see someone create their own version. Do you have ambitions to try doing mark two of any other real world spacecraft? PD: I wanted to create a few models that people could bolt together in an infinite number of combinations. I ended up with 5 or 6 modules in the basic set and just keep duplicating to build up the station. I don’t have any plans on doing any specific real world models. I’ll leave that to Bambam131 who has really got the style down. And in Bryce no less. 3DAD: “Peacock” and final “Peacock”. Nice idea to arrange a functional idea (solar sail) to into a more eye catching form. PD: I can’t remember if I was trying to model a peacock or a solar sail. But I like the idea of the sail unfolding like a peacock tail. Peacock was a proof of concept, Peacock 2 is slightly more refined. I’d quite forgotten about the model. I might have to make a Peacock 3! 3DAD: From your portfolio, what are your top two favourite renders? PD: Usually the latest ones are my favourite. I like anything with my Steampunk Sub. I like approach since it got my art published in a magazine. My other favourite is not even a sci-fi picture. There’s a Carrara render of a glass chess set that I made in Wings back in 2006. I really like how that turned out. The light and refraction just worked really well. 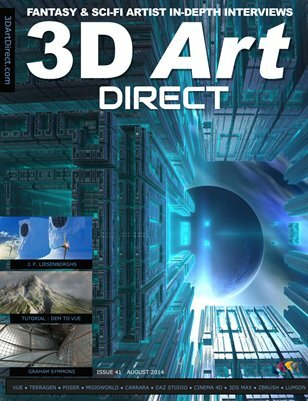 3DAD: Finally, what three tips would you give to those just starting out with 3D digital art? Tip 1 : Don’t be afraid to ask questions. There are plenty of forums out there and no matter what you’re trying to do, someone would have thought about it and will know the answer. Tip 2: Don’t give up. It’s easy to get overwhelmed when opening a new program and seeing all the settings and wording and you may shut the application down before achieving anything. But run it again and play around. What’s the worst that can happen? Tip 3: Create for yourself. Post your art by all means, but don’t create what you think people will want to see, create things that you want to create. …And finally (sorry, I know that’s four) – Have fun. This is for most of us a hobby and hobbies are supposed to be something fun!